My post yesterday about care of your Meyer lemon tree got long, so I didn't have room to fit in what I've learned about cooking with the fruits. Since Meyer lemons are actually a hybrid between a true lemon and an orange, their flesh is a bit sweeter than the lemons you'd buy in the store --- just sweet enough that sour-lovers like me can eat them raw. When cooking with Meyer lemons, I tend to lower the amount of sugar in the recipe a bit so that we're not overwhelmed with sweetness. I've also noticed that the zest (grated rind) isn't as tangy as that on a true lemon. Here I tend to cheat and throw in a bit of extra zest from a storebought lemon. On the other hand, Martha Stewart will tell you that the white part of a Meyer lemon isn't bitter, so you can just cut up the whole lemon and put it in various dishes --- I'll have to give that a try! 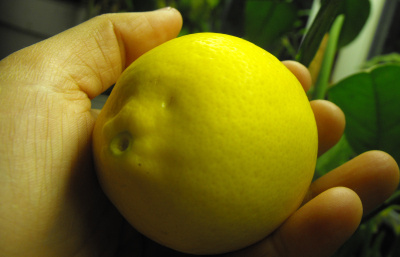 If you want to learn more about the Meyer lemon, I recommend this NPR article. Did you know they've been grown as container plants in China for over a century? Don't miss our sister blog about starting your own business.